Everyone’s favorite friendly spider and barnyard crew are heading back to the city April 10 - May 25 for all generations to enjoy their tale of friendship. E.B. 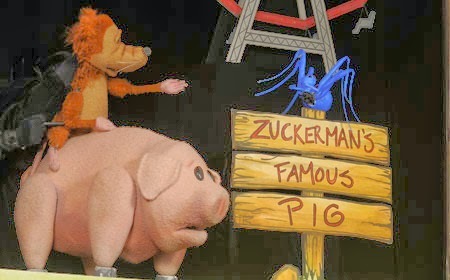 White’s timeless story, Charlotte’s Web, will wow guests at the Center for Puppetry Arts with its heartwarming wisdom as Charlotte the spider saves Wilbur the pig by using her wits, words and webs. With the help of some of the barnyard’s most colorful residents, including Templeton, the gluttonous rat, this family favorite shares the enduring message of how friends can work together to overcome adversity. Adapted by Joseph Robinette and directed by Jon Ludwig, Charlotte’s Web features a variety of puppetry styles performed by skilled puppeteers Dolph Amick, Brian Harrison, Reay Kaplan, Amy Sweeney and Tim Sweeney. All of the puppets, props and scenery bring the iconic illustrations from the book to life on stage and were created onsite by the Center for Puppetry Arts’ talented staff. Tuesday- Friday: 10 a.m. & 11:30 a.m. The Center is CLOSED on Sunday, April 20. Tickets include museum admission and entrance to the Create-A-Puppet Workshop (or To-Go Kit), where children can make their own Charlotte the Spider marionette to take home with them as a reminder of their barnyard adventure. One lucky Bluebird Patch reader will win a family four pack for the April 12 (12pm) performance. To enter all you have to do is leave us a comment on this post. Want to earn an extra chance at winning? Facebook: “Like” TheBluebird Patch leave a comment on this post: https://upload.facebook.com/TheBluebirdPatch/photos/a.124161917603250.17208.124159477603494/756830487669720/?type=1&stream_ref=10 and let us know your favorite character! We’ll announce the winner on April 10.